Partly to mostly cloudy skies with scattered thunderstorms during the evening. Low 48F. Winds SSW at 5 to 10 mph. Chance of rain 50%.. Partly to mostly cloudy skies with scattered thunderstorms during the evening. Low 48F. Winds SSW at 5 to 10 mph. Chance of rain 50%. Kyle Lovern/Williamson Daily News The new owners of the Mountaineer Hotel are pictured in the lobby of the historic building. Left to right, Murphy Poindexter, Dr. Donavan "Dino" Beckett and Jody Gooslin. Kyle Lovern/Williamson Daily News The historic hotel pictured above was built in 1925. Among the notables who lodged and made public appearances at the hotel were: President John F. Kennedy; First Lady Eleanor Roosevelt; movie actors Greer Garson, and Paul Newman; and, musicians June Carter-Cash, Jerry Lee Lewis, Loretta Lynn, Merle Travis, Conway Twitty, and Hank Williams, Jr.; and boxer Jack Dempsey. 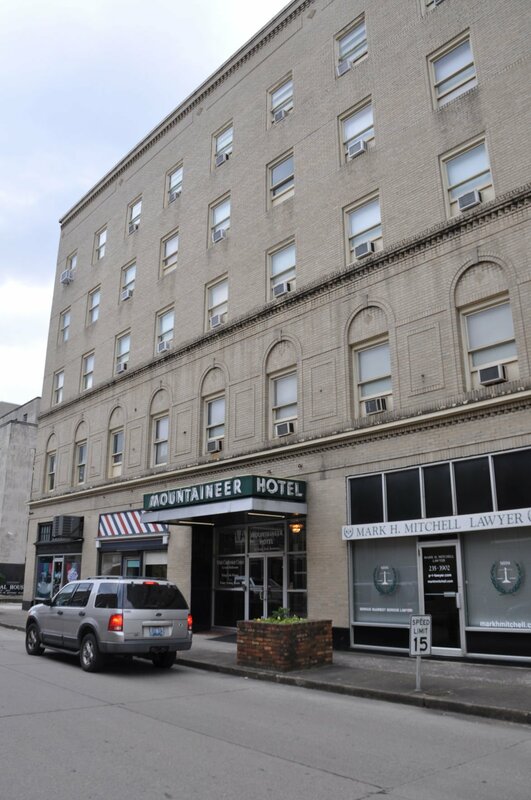 WILLIAMSON - Three businessmen have purchased the historic Mountaineer Hotel in downtown Williamson. The trio includes local physician Donovan "Dino" Beckett, Murphy Poindexter and Jody Gooslin. The final documents to close the deal were signed last week. "We want to maintain the level of quality that Mark (Mitchell) and Edna have put in place," Beckett said. "They have done a tremendous job as far as preserving the history of the hotel. They have done a great job and have been stewards for this building." The hotel, located on Second Avenue, predominantly served as a lodging for railroaders in the latter part of the 20th century. Norfolk Southern Railroad crews for the incoming and outgoing trains would stay at the hotel. This stream of business kept the hotel occupied and in operation during a period of recession. In December 1995, Mitchell, a local attorney, purchased the hotel from attorney J. Brooks Lawson. Mitchell restored the hotel and at one time had a restaurant and cigar bar in the building. The building was added to the U.S. National Register of Historic Places on March 21, 1997. The hotel features renovated guest rooms, a beautiful lobby with Schonbek chandeliers (the same type of chandeliers that adorn The White House), modernized conference centers, and many other amenities. "Our goal is to to increase usage and participation of the hotel," Beckett added. "We want this to be a community cornerstone. This hotel is a historic gem. We are going to take it to another level." Most recently many tourists and ATV riders have stayed at the hotel. The new owners hope to see that trend continue and attract more visitors to Williamson and have them stay at the hotel. "From my travels, this is the best hotel in southern West Virginia," Poindexter said. "We are hoping to keep it that way. We want to bring down more people in to visit Mingo County and to have a place for people to stay when they come back home." The five-story building has more than 80 rooms. "This is a part of a long-term bet on the future of West Virginia, we are going to invest in expanding and updating more rooms," Poindexter said. "The near-term plan is to bring groups of people who want to have a team building experience down to Mingo County." "We want to be able to ramp these events up," Beckett said. "I am glad to be a part of this project," Gooslin said. The mezzanine has been the location of parties, high school reunions, wedding receptions, and in past years, the Williamson High School prom. The new owners hope to rent the hotel and utilize it for similar events and even some musical programs. "We want to have events here and show everyone what Williamson has to offer," Poindexter said. "Too many people don't know that this place is a beautiful and easy hour or so drive south of Charleston." Many famous people stayed at the hotel. Perhaps the most prominent guest was presidential candidate John F. Kennedy, when he was campaigning in West Virginia during the 1960 primary election. Among the other celebrities who lodged and made public appearances at the hotel were First Lady Eleanor Roosevelt; movie actors Greer Garson and Paul Newman; musicians June Carter-Cash, Jerry Lee Lewis, Loretta Lynn, Merle Travis, Conway Twitty, and Hank Williams, Jr.; and world champion boxer Jack Dempsey. Poindexter said when his friends walk into the hotel they are amazed. "We want to focus on tourism, business travel and leisure," he concluded. He said many motorists drive by this area. They want them to start staying in Williamson and patronize not only the hotel, but the restaurants and other historic sites the Tug Valley has to offer. Kyle Lovern is editor for the Williamson Daily News. He can be contacted at 304-236-3526 or via email at klovern@HDMediaLLC.com.